In the heart of Santa Fe, this authentic Santa Fe home was built in 1947. Gorgeously remodeled with multiple features it is sure to please! The master suite is separated from the other bedrooms and has it's own private bathroom. Our beds are comfortable and dressed with luxury quality linens that allow for total relaxation. Experience Santa Fe in style. 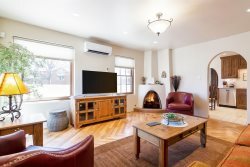 My place is close to the rail yard district, Farmer's Market, downtown historic Santa Fe plaza, steps away from Whole Foods, art and culture, and several other restaurants. You’ll love my place because of the ambiance and the proximity to downtown! This home has been beautifully updated! Gorgeous furniture makes this home super cozy. Bedrooms include a king size bed in the master suite and one queen size bed in each of the two bedrooms. A walk down the street puts you in the ever popular Whole Foods grocery store. Also, you are a short walk from the Rail Runner Train Depot, the popular Tomasitas Restaurant, and the downtown historic plaza! You will be able to enjoy the entire house and the outdoor space!